Woohoo! 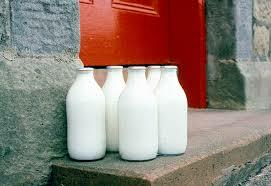 I’ve just negotiated a doorstep delivery of milk! It is a bit more expensive than the stuff from Waitrose (54p a pint rather than 38p), but it comes from a local farm and local dairy (details to follow, apparently! ), they do non-homogenised semi-skimmed and it comes IN GLASS BOTTLES that they take away and reuse. The deliveries will always be before 6.30, so there won’t be a problem with it sitting out on summer days when we’re both at work. Apparently we can also get other dairy products and fresh juices, which is great; currently the bulk of our supermarket shopping is dairy – milk and yoghurt regularly, cream/creme fraiche occasionally and cheese when we can’t swipe it off the bf’s mum – fruit juice and dry goods (rice, pulses etc). We currently don’t have the cupboard space to do bulk orders for dry goods, although I’d like to in the future, but we only need to shop for those very occasionally, so by getting milk (and possibly other stuff) delivered, I can probably halve the amount of time I spend shopping by not needing to go every week. Hurrah. And glass bottles! Glass bottles! Is it weird to be so extraordinarily excited by this prospect? We can recycle the plastic ones, but recycling plastic isn’t as good as recycling glass or metal (can only be done once, or maybe twice, and then it goes into landfill anyway, whereas glass or metal can be recycled again and again), and it gets re-used first, and, as we all know, reduce and re-use come before recycle…. Entry filed under: milk, recycling, rubbish. No, no you’re not a nutter, I quite understand. I personally don’t ‘drink’ milk (use it in cooking etc) as I’m a fussy vegetarian (Rich berates me as he can’t believe I don’t like drinking it) but currently we buy the organic stuff from the supermarket. HOWEVER, we grew up with deliveries from the milkman. He used to come to the back doorstep to leave the milk there for us, right by the kitchen. And there was nothing as satisfying as popping through the new foil lid with your thumb. Nothing, not even splitting a kitkat!!!!! I want Rich to get into buying from the milkman, not sure if he’ll convert though. I think milkmen offer a great community service, too. A lot of elderly and disabled people are reliant on them so if the rest all stopped using them those people would suffer. I once knew a lady who left her post out for the milkman who’d take it with him and pop it in a post box for her. And as you say, your milk is coming from a local farm where the farmer’s no doubt being paid a reasonable sum for the milk whereas supermarket milk usually comes from another part of the country and the farmer’s given a pittance for his hard work. I know which I’d rather support. Oh good, I’m glad you understand. Now I remember why I started a blog!